Tamashii Taiko Drummers is a contemporary Japanese taiko drumming troupe based in Auckland, New Zealand. We are best known for our high-energy performances, and for mixing martial arts movements into their performing styles. Tamashii has performed on TV1, TV3, WorldTV, and SkySports several times, and in the Rugby World Cup grand opening ceremony, and we collaborate often with international artists. Our group composes and choreographs our own music, designs our own costumes, teaches seven levels of taiko classses, and builds all of our own drums - including our 2.6m tall giant drum “The O-daiko” which is thought to be the largest performing drum in the southern hemisphere. In Japanese, the word tamashii means spirit. We chose this name because it represents our style of playing, very high energy and full of life. Depending on the type of Romaji used, Tamashii can be rendered in a number of different ways, including tamashii, tamashi, tamasii, and tamasi. Tamashii is pronounced TA-ma-shee, with the TA having a higher tone. Tamashii was founded in 2007 by three passionately-inspired taiko fans - Brian Grove, Jane Chen, and Michael Wells. 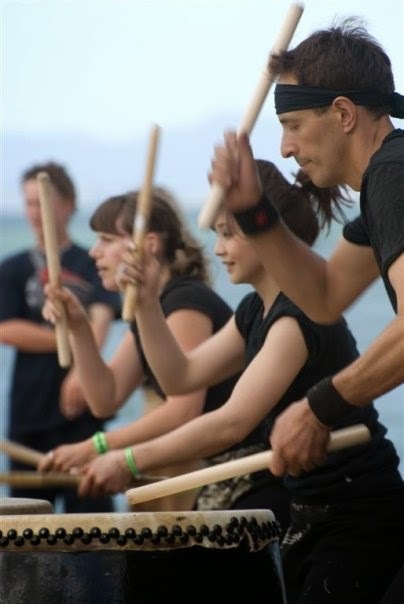 We created the group to allow us to further the art of taiko in New Zealand, and to share our passion with as many people as possible. Our first teachers were Sahoko Yazaki and Midori Uenoya, two amazing taiko teachers who we will always be inspired by.